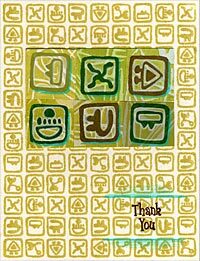 Welcome to the tenth issue of the Carolyn Hasenfratz Design and Carolyn's Stamp Store email newsletter. If you are looking for a unique gift for a special child in your life, make it memorable and personal. MyChristmasBook.com brings to life the story of Santa and the Lost Dog and your child becomes part of the story through personalized text, images and audio narration. The personalized Christmas Story Photo Book is posted on a personalized webpage with a unique North Pole address that you can share with friends and family. Go to http://helper.mychristmasbook.com/NorthPole/personalizemybook@gmail.com to see a sample. ISPs are understandably on a mission to block the emails people don't want, and to let in the emails their customers do want. Many spam emails do get blocked through their efforts, but unfortunately some legitimate emails also get blocked accidentally. As a sender, you might know what the official definition of spam is, but to an end user, spam might just mean something they aren't interested in right now. Did you know that some users use the report spam button as a way to unsubscribe from a sending they no longer want instead of using the unsubscribe link provided in the email? Did you know that some email recipients use the report spam button on their email client as a delete key? Did you know that you can even get banned for being on the same ISP as someone else whose emails were labeled as spam, either rightly or wrongly? It's unfair, but it is possible to get on banned lists without ever doing anything wrong. The retail holiday season we're in now brings an increase in commercial email traffic, and with it more potential false spam reports as people get impatient with all the email they're getting. 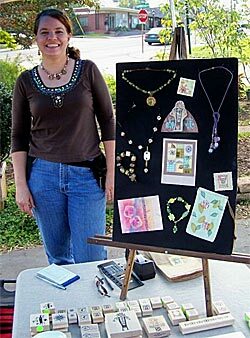 A couple of years ago, while exhibiting in an outdoor art and craft show, my booth was next to a man who was exhibiting his artwork for the first time. He asked me for some tips on how to expand the opportunities to show his work. He outsold me at the show, so I'm not sure he needed my advice, but since he asked I sent him an email later with some suggestions for finding shows. In case any of you creative people out there can benefit, the following is what I wrote to him. First start to compile a list of shows you'd like to do. Organize the show information in a three-ring binder in order by when they take place in the calendar year. Record information such as entry deadline, show dates, requirements, fees, etc. Get a physical or computer-based calendar or both, whatever works best for you, and record the dates of shows you want to do and their application deadlines as early as possible so that you don't miss deadlines or accidentally schedule too many things at the same time. Attend shows in person - that's a good way to see if the show is worth the effort. Is the attendance good? Did the show organizers do a good job with publicity and organizing? Do the exhibitors look like they're doing reasonably well? Is the other work on display likely to attract people who will like your work also, or will you feel out of place? Artists who are exhibiting, unless they are doing a brisk business and don't have time to chat, are often grateful to have someone to talk to for a few minutes. Start a conversation with some of them. If you genuinely like their work, it will be easy to find something to talk about. If they seem agreeable to talk about such things, ask what they think of the show. Would they come back next year? What other shows have been positive experiences for them? Take a look at how people are displaying their work. You will get some ideas you can use for your own display. If it's an outdoor show and there are weather issues, which artists seem to be coping well, and how are they doing it? After you get home from a show, record what you've learned while it's still fresh in your mind. Make a wish list of things you want to acquire for your booth or table, so you can start looking for deals on the items. Some you might be able to acquire secondhand, or get on sale. That's more likely to happen if you give yourself time to track the items down, rather than panic-buying at the last minute (like I usually do). If you've picked up any tips for future shows you might want to do, use the Internet to research the shows and add the information to your show binder so that it will be handy when you need it. If the organizations putting on the shows have a web site and a contact address available, ask to be added to their mailing list. For 10 or 11 years now, I've been making melt and pour soap bars and other related items at the holidays to give away as gifts. By now, my holiday season is not complete without this activity, though of course I make things for my own use all year long. 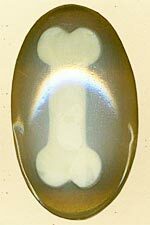 I've posted a couple of new recipes to my Melt and Pour Soap Recipes page, Dog Soap Bar and Bayberry and Vanilla Soap Bar. Enjoy! I have also started carrying embossing inks and powders in 27 colors for your stamping fun! 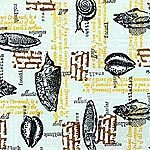 On the Carolyn's Stamp Store site, I maintain a page of pattern samples to demonstrate how I made certain patterns and to inspire you to use your stamp collection in new ways. My latest sample uses the new Sea Life stamps, which I'm currently using on a couple of home decor projects in my living room - it contains three freshwater aquariums! Speaking of Aquariums, I got my Fishcam working again, although now it is a Crayfish Cam. 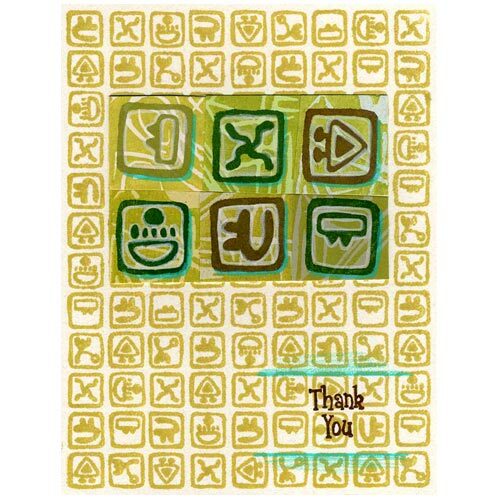 Here is an easy Thank You card to make. The designs are abstract, so it's appropriate for any occasion.